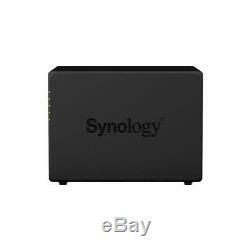 Synology DiskStation DS918+ 4-Bay NAS Enclosure, Quad-Core 1.5GHz, 4GB RAM, No HDD. DiskStation DS918+ Powerful and scalable 4-bay NAS for growing businesses. High-speed scalable storage server Synology DS918+ is designed for small and medium-sized businesses and IT enthusiasts. With a powerful built-in AES-NI hardware encryption engine, DS918+ provides exceptional encrypted file transmission. Also capable of transcoding up to two channels of H. 264 4K videos at the same time, DS918+ is ideal for sharing and storing ultra-high definition media content. Satisfy your need for performance and capacity DS918+ supports up to two M. 2 NVMe 2280 SSDs, allowing fast system cache creation without occupying internal drive bays. Scalable up to 9 drives with a Synology Expansion Unit DX517, DS918+ answers the need for flexible storage capacity. Btrfs: Next generation storage efficiency Btrfs file system introduces the most advanced storage technologies to meet the management needs of modern large scale businesses: Flexible Shared Folder/User Quota System provides comprehensive quota control on all user accounts and shared folders Snapshot Replication provides schedulable and storage capacity-saving data protection with 1,024 shared folder backups and 65,000 system-wide snapshots File or folder level data restoration makes data recovery fast and flexible Automatic file self-healing detects and recovers corrupted files without user intervention Digital asset protection Powered by Synology DiskStation Manager (DSM), Synology NAS offers advanced security measures to protect against sudden data loss and potential security holes. Security Advisor Analyzes system settings, password strength, network preferences and removes any possible malware. AppArmor A kernel-level enhancement that blocks malicious programs from accessing unauthorized system resources. AES 256-bit encryption Encrypt shared folders and network data transmission to keep data from unauthorized access. 2-step verification Prevent others from logging in to your DSM by generating a one-time password (OTP) on your mobile device. Trust Level Customize the trust level in Package Center to avoid installing packages from untrusted sources, safeguarding your NAS from unknown or tampered package files. Synchronize files across your devices Cloud Station Suite provides real-time data synchronization across all your devices and other Synology NAS. "Intelliversioning" keeps the most important file versions to better utilize storage space. 4K Multimedia Server Access and stream your 4K media content anytime and anywhere. 265 online transcoding via Video Station and DS video, allowing 4K videos to be converted and played on the fly on other computers, smartphones and media players that originally do not support Ultra HD formats. Powered by Synology DSM Surveillance Station Complete surveillance solution for recording, monitoring and management. Collaboration Suite Synology Office, Calendar and Chat guarantee a secure and high-performance private communication and user-friendly content organization. DSM UI Award-winning operating system with an intuitive user interface and powerful capabilities. Desktop Backup Simplified backup solution for your Mac, PC and mobile devices. Security Comprehensive built-in security tools are constantly updated to tackle evolving threats and protect your devices. Quad Core 1.5 GHz burst up to 2.3 GHz. 265 (HEVC), MPEG-2 and VC-1; maximum resolution: 4K (4096 x 2160); maximum frame rate per second (FPS): 30. Maximum Drive Bays with Expansion Unit. 3.5" SATA HDD 2.5" SATA HDD 2.5 SATA SSD M. 48TB (12TB drive x 4) (Capacity may vary by RAID types). Max Raw Capacity with Expansion Units. 108TB (48TB + 12TB drive x 5) (Capacity may vary by RAID types). 2 (with Link Aggregation / Failover support). Btrfs EXT4 EXT3 FAT NTFS HFS+ exFAT. 92mm x 92mm x 2 pcs. Full-Speed Mode Cool Mode Quiet Mode. Power Supply Unit / Adapter. 28.8 W (Access) 12.6 W (HDD Hibernation). 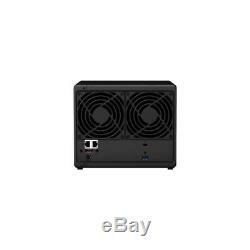 98.27 BTU/hr (Access) 42.99 BTU/hr (HDD Hibernation). C 41 to 104 deg. C -4 to 140 deg. EAC VCCI CCC RCM KC FCC CE BSMI. ISCSI LUN Clone/Snapshot, Windows ODX. SSD Read/Write Cache (White Paper). 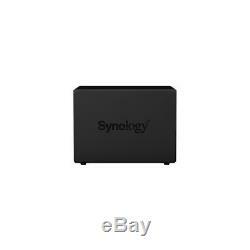 Synology Hybrid RAID Basic JBOD RAID 0 RAID 1 RAID 5 RAID 6 RAID 10. Basic to RAID 1 Basic to RAID 5 RAID 1 to RAID 5 RAID 5 to RAID 6. Volume Expansion with Larger HDDs. 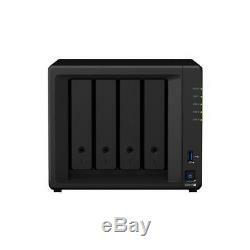 Synology Hybrid RAID RAID 1 RAID 5 RAID 6. Volume Expansion by Adding a HDD. Synology Hybrid RAID RAID 5 JBOD RAID 6 (with Expansion Unit). Global Hot Spare Supported RAID Type. 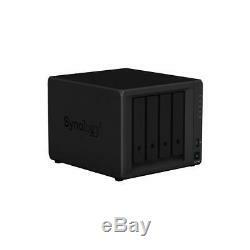 Synology Hybrid RAID RAID 1 RAID 5 RAID 6 (with Expansion Unit) RAID 10 (with Expansion Unit). Maximum Shared Folder Sync Tasks. Windows Access Control List Integration. VMware vSphere 6 with VAAI. Max No of Concurrently Connected Devices. Max Connected Devices (RAM expansion). Maximum Number of Synced Files (btrfs). 1,000,000 / single file reaction time 744 ms. Maximum Number of Synced Files (ext4). 1,000,000 / single file reaction time 630 ms. Maximum Number of Synced Files. 500,000 / single file reaction time 362 ms. Max Concurrent Connections (PC Clients). 5 (Licenses required for additional accounts). Up to 90 (Btrfs) / 90 (ext4). 840,000 (Btrfs) / 1,014,000 (ext4) emails per day, approx. 25.6GB (Btrfs) / 30.9GB (ext4). Maximum Snapshots per Shared Folder. Maximum Snapshots of all Shared Folder. Maximum IP cam (Licenses required). 40 (including 2 Free License). 1200 FPS at 720p (1280x720) 840 FPS at 1080p (1920x1080) 550 FPS at 3M (2048x1536) 300 FPS at 5M (2591x1944) 180 FPS at 4K (3840x2160). 1200 FPS at 720p (1280x720) 1200 FPS at 1080p (1920x1080) 900 FPS at 3M (2048x1536) 550 FPS at 5M (2591x1944) 300 FPS at 4K (3840x2160). 720 FPS at 720p (1280x720) 500 FPS at 1080p (1920x1080) 330 FPS at 3M (2048x1536) 200 FPS at 5M (2591x1944). 2 channel, 30 FPS at 4K (4096 x 2160), H. 265 (HEVC) or 2 channel, 30 FPS at 1080p (1920x1080), H. Max Virtual DSM No (Licenses required). 4 (including 1 Free License). CIFS AFP NFS FTP WebDAV CalDAV iSCSI Telnet SSH SNMP VPN (PPTP, OpenVPN). Domain Users login via Samba/AFP/FTP/File Station. FTP over SSL/TLS IP Auto-Block Firewall Encrypted Network Backup over Rsync HTTPS Connection. Windows 7 and 10 Mac OS X 10.11 onward. 166 x 199 x 223mm (6.54 x 7.83 x 8.78). 2.28kg (5.03 lbs). Approved Change Requests may not be updated on eBays portal, please check the emails. Memory cards and any other Blister Pack items are not returnable once opened. Printers are not returnable once the Toner Cartridges have been installed or released. 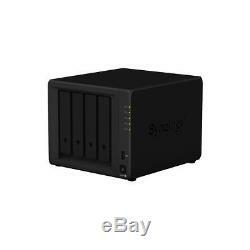 The item "Synology DiskStation DS918+ 4-Bay NAS Enclosure, No HDD" is in sale since Wednesday, May 9, 2018. This item is in the category "Computers/Tablets & Networking\Home Networking & Connectivity\Other Home Networking". The seller is "adoramacamera" and is located in Elizabeth, New Jersey. This item can be shipped to United States, Canada.